A unique example of some of the lowest surface brightness galaxies in the universe with lower amounts of heavier elements and hence are faint and difficult to find have been located by an international team of astronomers led by the Niels Bohr Institute. The discovery suggests that small low surface brightness galaxies may have more in common with the first galaxies formed shortly after the Big Bang than previously thought. The galaxy called ESO 546-G34 is a nearly 20 year old observation that no one had previously taken much notice of. The observation has now been analysed using new methods and it is only now that astronomers have realised how special it is. Compared to other galaxies of this type the ESO 546G-34 has a very low content of oxygen, nitrogen and an extremely small amounts of heavier elements. It contains at least 50 percent gas, which is several times higher than the corresponding values for a large evolved galaxy like the Milky Way. "The galaxy gives us an idea of how the galaxies must have looked before star formation really got going", explains Lars Mattsson, an astrophysicist at the Dark Cosmology Centre at the Niels Bohr Institute, University of Copenhagen. The discovery was made in collaboration with astronomers at Uppsala University and the Astronomical Observatory in Kiev. Most of the known galaxies that have only formed small amounts of the heavy elements are young galaxies that are undergoing gigantic outbursts of star formation. This makes them incredibly bright and easier to observe. One type of galaxy with bursts of star formation is called blue compact galaxies, as newly formed stars emit a bluish light. The galaxy that has been observed is small and contains only extremely small amounts of the heavier elements. That it consists mostly of the gases hydrogen and helium and is so faint means that it has only just begun to form stars. "Our analysis shows that while a large, mature galaxy like our own galaxy, the Milky Way, is comprised of around 15-20 percent gas, this faint little galaxy is comprised of up to 50 percent gas and is very poor in heavier elements. This means that it is very unevolved", explains Lars Mattsson. The theory is that the very small faint galaxies collide with each other and the greater concentration of gas material and dynamical disturbance boosts star formation and thereby form the larger blue, compact galaxies. "ESO 546-G34 is a left over dwarf galaxy that doesn't seem to have collided with other galaxies. This gives us unique insight into how the earliest galaxies in the universe may have looked", explains Lars Mattsson. 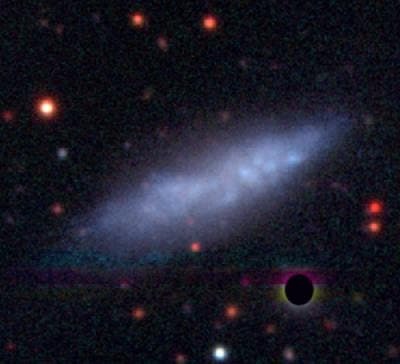 The Daily Galaxy via University of Copenhagen. The results have been published in Monthly Notices of the Royal Astronomical Society.